Simon found an older version of this boat back in the eighties and realized that its thousand-year-old design could be copied and preserved without too much difficulty. He measured it out in ’89 and Bill Nielsen lofted it and drew up the plans in ’91. Twenty-something years and many boatbuilding classes later, those plans have been turned into a digital download that Simon hopes will put more Norwegian Prams back on the water. His son, Richard, can answer more questions at the contact information below. The Norwegian Pram is an ideal project when building a boat with young people. 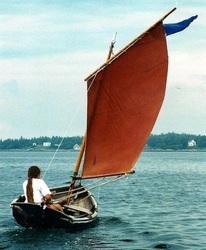 It is small, only 11-1/2 feet and easily handled by children under oar or sail. Simon’s added a section in the building manual advising on tools, the height of benches, safe use of machines and much more. All included when you purchase plans for the Pram!